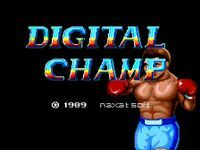 Digital Champ Battle Boxing is a single-player video game released in 1989 for TurboGrafx-16 by Naxat Soft. The game was released to the Virtual Console in Japan on April 15, 2008, Europe on May 16, 2008, and in North America on October 20, 2008. The game takes place in the fictional year 20XX, with the main player as a mutant fighting hordes of boxer clones before facing off against a robotic boxer. Three clone opponents exist; Marciano, Mick and Samson. Each match is a maximum of twelve rounds, each being three minutes. Source: Wikipedia, "Digital Champ Battle Boxing", available under the CC-BY-SA License.